Webers or Dellorto, Solex, SU or Holley, any of these in small measure will do the trick. But why are they such delicate creatures? The 1974 Alfa Spider Veloce 2000 is running sweetly. The head has been off to the head-dresser. Very Italian – a shave and a trim and it was looking respectable again. New gaskets, some spit and polish and the Spider was purring. But a stable idle proved elusive. 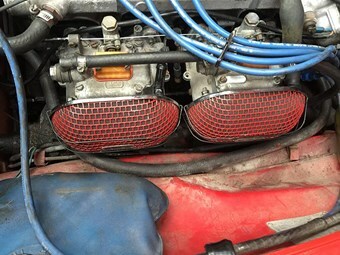 The stylish aftermarket air cleaners with cute matching red-mesh-encased sponge covers replaced the cumbersome and ugly air filter box. Aesthetically terrific. Aurally satisfying. Terrific for performance. But the air intake plenum (now there is a word we do not hear often enough) is apparently an essential part of the intake set up and once dispensed with the carbs went all wonky. No amount of fettling would get a stable idle. New intake rubbers and mounts, new everything inside, carb cleaner – no amount of mucking around would do the trick. Experimental fiddling was required. When the motor was fed carbs it was regular. But it did not take much to give it the runs. And as with people, it turns out a bit of fibre in the diet made all the difference. The plenum itself is only part of the picture. It has a hidden secret mount. Beneath the cylindrical filter box there is a long steel support that serves as a mount holding the plenum and air filter box in place. The plenum bolts on to the carbs, keeping it all nice and tight. Keeping it all honest is a rubber bush at the base, which bolts to the engine mount. Once we had removed the plenum and air filter box, we had also removed the long steel rod and bushing – and that left the carbs unsupported and floppy. Without the mounting, they were moving ever so slightly with the rocking motion of the motor. The air intake was constantly altered, affecting the mixture and preventing a steady idle. The rubber mounts between the motor and the carbs were never intended to hold the weight of the Dellortos and were burping and farting as a result. So I have to devise a new mount for the carbs. I am in the process of taking a steel plate and drilling and filing out the identical pattern of holes and slots mimicking the intake side of the plenum. This will be mounted across the two carbs, between the air filters and the carb skin, with a ’T’ mount for the long steel support and bush. Once finished, it will replicate the structure that was designed originally. So I will have the stability of the old set-up without the bulk and weight and ugliness. Then once I get that out of the way, I can try to find out why the right-hand front brake is grabbing. Having fitted a new master cylinder and wheel cylinders all around, my suspicion is now directed at the dual boosters. Finding someone to recondition them is proving a challenge and they cost a bomb to replace. More money, more hassle. But once these small challenges – making the car go and stop – are attended to, then I can drive the little beauty. Until I get pulled over because of the rust.